FAQ: How do you turn on verbose logging when connecting to an enterprise geodatabase? How do you turn on verbose logging in ArcGIS for Desktop when doing a direct connection to an enterprise geodatabase? This entry was posted in General and tagged ArcSDE, connect, connection, Database view, direct, Geodatabase, logging, SDE, SDEVERBOSE, TRUE, verbose on September 22, 2016 by Greg B. This is a recurrent question in my geodatabase seminars. “ArcSDE” is a concept that has always created some confusion, and part of the reason is, I think, due to how ArcSDE has evolved overtime. Do I get the same spatial capabilities using native database spatial data versus ArcSDE enhanced spatial databases – even when both use the same spatial data types – for example, do I get the same capabilities using a MS SQLServer database using the Geometry spatial data type and a MS SQLServer ArcSDE enhanced database using Geometry spatial data type? Is it the same multiuser editing found in SQL Server or any other database and the multiuser editing available with ArcGIS? Is it the same “replication” functionality the one found in a database and the one we have with the Esri technology? A short answer to all these questions is: – No, it is not the same. 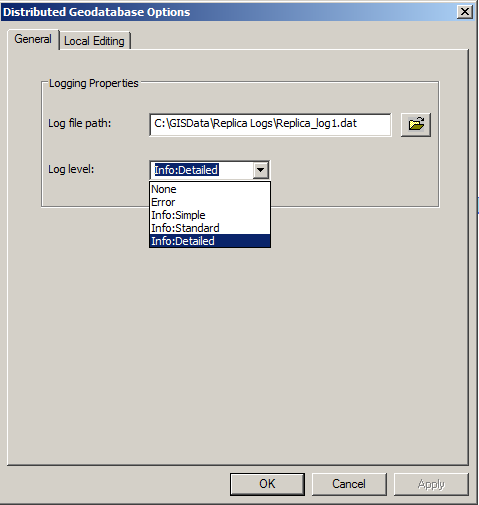 This entry was posted in General and tagged ArcGIS, ArcSDE, Geodatabase, SDE on December 23, 2015 by Simonazzi W.
How can I access the Replica log? Whenever a replica creation or synchronization process is performed with ArcGIS Desktop, whether it be connected or disconnected, detailed information about the process is recorded in a replica activity log. The replica log file can be found in the temp directory (as defined by the temp environment variable) of the machine on which the replica operation was executed. Thus, the location the ReplicaLog.dat file would be in Eg. for Windows 7 – “C:\Users\tthompson\AppData\Local\Temp”. *** New at 10.1, you can choose the location of the file and the level of detail recorded. This option is available from ArcMap 10.1 > Distributed Geodatabase toolbar > Distributed Geodatabase menu > Options > General Tab > Log level. This entry was posted in General and tagged Distributed, Geodatabase, log, replica, replication, SDE on October 12, 2012 by Tania T.
Are you receiving the following error: “Lock request conflicts with an established lock.” or unable to change any properties of your data via ArcCatalog? This entry was posted in General and tagged Dekho, Map services, Schema Locking, SDE on February 6, 2012 by Tania T.
Up to and including v10.0, the ArcCatalog “Set Data Source” tool is only designed for updating MXD file based data sources such as Personal and File geodatabases. This entry was posted in General and tagged ArcCatalog, ArcSDE, connections, Geodatabase, repair, SDE on December 15, 2011 by Stef.